Fig. 1: General view of Al-Khidr site with general map of apparent resistivity for vertical component. Al-Khidr is a Bronze Age (Early Dilmun) site in the north-west of Failaka that has been excavated by the Kuwaiti-Slovak Archaeological Mission (KSAM) since late 2004. The site indicated by numerous sherds and stone alignments over uneven surface is not in full accessible for digging. 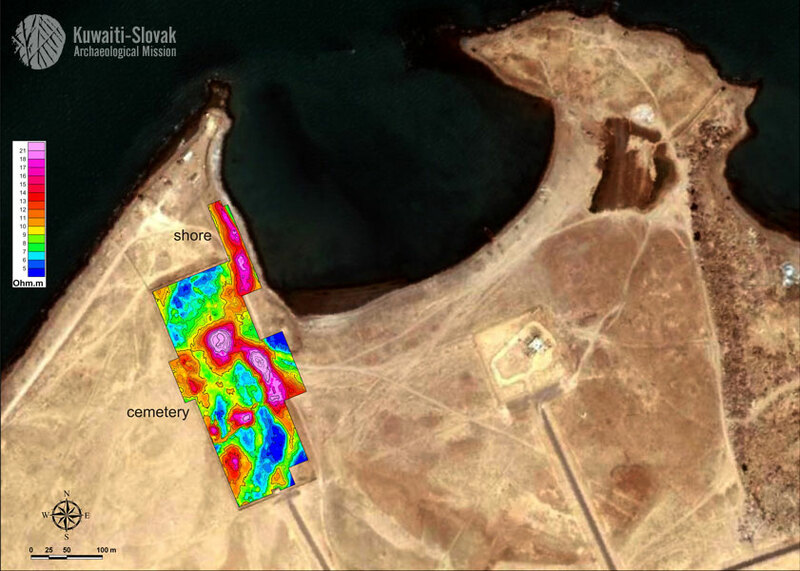 While a smaller part on the western shore of Al-Khidr bay is fully accessible for both non-destructive and destructive archaeology, a larger portion below the ground of a modern Islamic cemetery is available only for field-walking and geophysical prospecting (fig. 1). Geophysical survey, which is aimed at tracing archaeological structures to estimate the extent of the site, has been carried out at Al-Khidr since 2004. Unlike DEMP and GPR, magnetic method turned to be unsuitable due to the large amounts of iron (Gulf War) spoiling the signal. Fig. 2: Comparison of geophysical (DEMP, horizontal component) and archaeological results on the shore of Al-Khidr. During the first season (2004) the shoreline part of the settlement and 2 smaller test areas in the cemetery were measured by DEMP and maps of apparent resistivities were produced (values 16 – 34 Ohm.m for horizontal component and 9 – 20 Ohm.m for vertical component, device EM38 from Geonics Company/Canada). After comparing results of the DEMP measurements with results of excavation it was possible to associate anomalies on the shoreline with the Bronze Age architectural remains (value 29 – 34 Ohm.m for horizontal and 17 – 20 Ohm.m for vertical component, pink and violet colours; fig. 2). In the next seasons (2006, 2007) the whole cemetery ground was prospected by DEMP. The map of apparent resistivities for the cemetery showed same values of anomalies as the map for the area along the shoreline. This fact together with Bronze Age sherds from the surface of the cemetery allowed us to assume here some Bronze Age architectures and to conclude that the Bronze Age settlement spread from the shoreline to the south-west (fig. 1). However, a sounding in the peripheral zone of the apparent resistivity anomaly outside the middle of eastern cemetery wall did not prove any buried features. As the core of the anomaly lies inside the cemetery, which must for now remain unexcavated, we could not investigate its origin. Fig. 3: Results for Al-Khidr shore. The areas on the shore and in the cemetery previously measured by DEMP were in 2006 and 2007 surveyed by GPR (device RAMAC X3M from Geoscience Mala Company/Sweden with 250 MHz and 500 MHz antennas). The GPR collected data have been presented in vertical and horizontal plains and further analysed by a complex image processing. Fig. 4: 3D model of bedrock layers on Al-Khidr shore on the basis of GPR data (250 MHz antenna). as varying level of water table testify to local changes of palaeorelief. As seen on the vertical GPR profiles, the bedrock layer between the two curved lines is not fully interrupted. 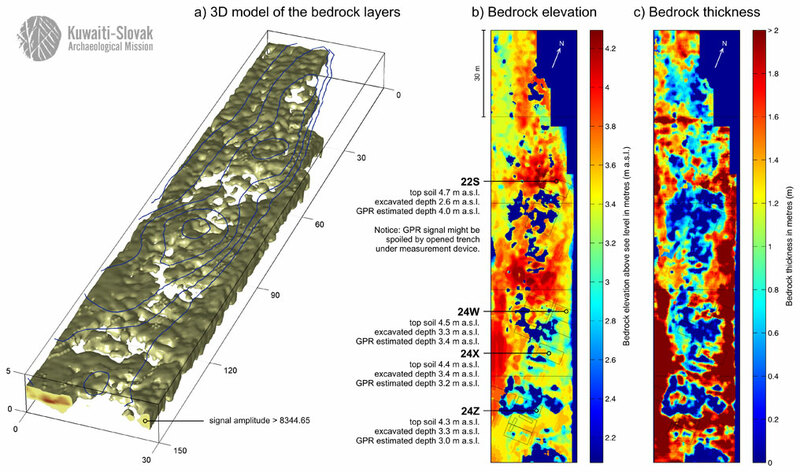 Even a 3D model of the bedrock layers built from the vertical GPR profiles hardly shows major disturbances of the bedrock in the extent estimated from fig. 3 on the spots with lower amplitude of signal (below 8344.65; fig. 4a, 4b). Accordingly, the hypothesis about an earlier coastline has to be viewed with caution. The 3D bedrock modeling as well as depth and thickness estimation (fig. 4b, 4c) has been carried out using the scientific computational environment Matlab R2006a. Fairly good agreement between real bedrock depths and GPR estimated depths has been achieved in three soundings 24W, 24X, 24Z. However, in 22S a substantial estimation error has been observed (fig. 4b). Nevertheless, in this particular case the GPR signal might have been spoiled by opened trench under the GPR device while measuring. Therefore we may assume that our view of the bedrock layers is generally correct. Fig. 5: Comparison of geophysical (GPR, 250 MHz antenna, depth 75 cm) and archaeological results on the shore of Al-Khidr. However, the main goal of prospecting by GPR was to detect archaeological (architectural) remains. Leaving the areas of the highest amplitude of signal out of consideration, relation of GPR results (250 MHz antenna) with archaeological remains is rather problematic. As shown on the general horizontal slice for the measured area on the shore, the anomalies with amplitude of signal 3500 – 5000 (dark blue) follow the main course and orientation of the excavated architectures from the Bronze Age (fig. 3). However, as seen from detailed comparison of GPR images with what has been excavated, the radar signal from certain depths does not indicate buried stone architectures (fig. 5). Fig. 6: Comparison of geophysical (GPR, 500 MHz antenna, depth 30 cm) and archaeological results on the shore of Al-Khidr. the ground plans of underground structures. Fig. 6 shows e.g. continuation of the stone walls from trench 23W to the north (23V). At the same time it has to be kept in mind that the 500 MHz antenna, like the 250 MHz one, reflects not only archaeologically interesting structures (e.g. stone foundations) but also natural layers of sea rock that occur very close to surface on spots with lower altitude. Even though some details from GPR horizontal slices (250 MHz antenna) and DEMP maps of resistivities depict, perhaps, the same facts (fig. 2 and fig. 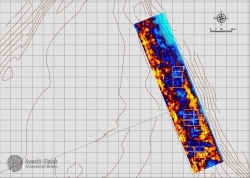 5), the GPR results from the 250 MHz antenna (used for the whole investigated area) cannot be unambiguously interpreted, even for the excavated area. Therefore, neither the line anomalies on the 250 MHz antenna horizontal slices from the cemetery allow univocal conclusion about the presence or absence of the Bronze Age stone architectures. As seen from comparisons of geophysically measured data and excavated situations, a simplistic interpretation of geophysical maps from environment of Al-Khidr may well be over- or misinterpretation of the buried features. Having learned our lesson on the shore, the question of the presence and extent of the Bronze Age structures in the cemetery seems to be open. 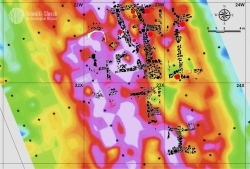 Beyond work at Al-Khidr site, KSAM is involved in the general archaeological survey of Failaka employing the geophysics also elsewhere on the island. 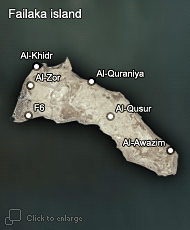 This first extensive survey project in the north of Arabian Gulf is possible only thanks to generous financial and material support of National Council for Culture, Arts and Letters (State of Kuwait) and the scientific background provided by the Institute of Archaeology of Slovak Academy of Sciences (Nitra, Slovakia). Barta, P. – Bartík, M. – Benediková, L. – Ďuriš, J. 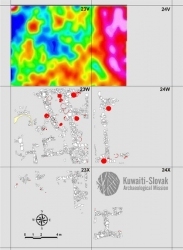 – Pieta, K. – Shehab, S. A. H. – Štolc, S., Jr. – Tirpák, J.: Geophysical prospecting of the Bronze Age site Al-Khidr, Failaka Island, State of Kuwait. Študijné zvesti Archeologického ústavu SAV 41, 2007, 69–73. Tirpák, J.: Al Khidr – shoreline – Final geophysical report. In: Al-Khidr 2008 – Final report on the fourth excavation season. KSAM. Failaka, 2009. Tirpák, J.: Al Khidr – shoreline – Final geophysical report. In: Al-Khidr 2009 – Final report on the fifth excavation season. KSAM. Nitra, 2010.